Schedule a meeting at the National Hardware Show or visit our virtual booth via video chat. The Pro-Curve Window Cleaning System allows you to easily clean windows of all sizes and shapes including solariums and atriums. Reach around obstructions such as, flowers, shrubs and statuary. Pro-Curve's ergonomic design reduces fatigue so you can clean faster! 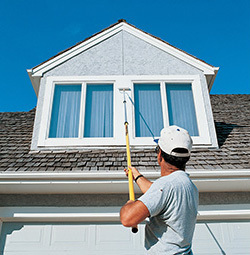 Painting with a Mr.LongArm extension pole is the fastest, easiest and safest way to paint. We offer many styles of poles and paint accessories that help you get the job done fast and stay on budget! Designed specifically for wood staining, the Woodmates® spectrum of tools can tackle all types of wooden surfaces the home pro may encounter. It’s wood staining...made simple. 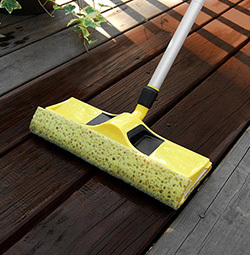 Mr.LongArm’s flow-through cleaning products make it easy to clean and care for outdoor living spaces. 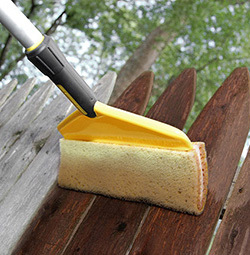 Flow-through brushes are available in many styles to clean wood, siding, brick, stone, tile, awnings, gutters and concrete. Designed specifically for interior painting projects, the Smart Painter System allows you to finish up faster, safer and easier. The spatter shield prevents messy paint spatters and the medium nap roller cover provides a smooth even finish. Roller cover is compatible with water or oil based paints. Twist-lok® extension pole allows you to reach up to paint walls and ceilings or down to paint walls or floors, without bending! A quick start guide to the benefits and features of the Smart Painter System II. This is our cost effective all-in-one extension pole and roller combo. Specifically designed for interior projects. Mr.LongArm, Inc. was the first company to offer telescoping extension poles and continues to lead the industry in their development. We utilize composite technology in the manufacture of tubing for extension poles that provides increased strength, durability, rigidity and versatility. We offer many styles of extension poles and accessories that help you get the job done fast! From our shortest 1-2 ft poles to our longest 8-23 ft poles, there’s a pole to help you access those hard-to-reach areas. Our product line-up includes painting and staining tools, window and solar panel cleaning equipment, cleaning brushes, bulb changers, letter changers, equine products and more.